MUMBAI, INDIA, Feb 14, 2018 - (ACN Newswire) - 3i Infotech Ltd (BSE: 532628, NSE: 3IINFOTECH), a global Information Technology company committed to empowering business transformation, has launched a new corporate logo that reflects both the evolution of the Company and its vision for the future. Over the last two decades, 3i Infotech, with its long-standing domain expertise, has become a recognized leader in providing IP based software solutions and a wide range of IT services. Its offerings have empowered business transformation for numerous organizations across geographies by helping them improve their processes and streamline their operations. Padmanabhan Iyer, MD & Global CEO, 3i Infotech, said "An ever-evolving business environment creates new possibilities for our clients. To keep pace with these changing times and technology, we at 3i Infotech remain ever sensitive to the needs of our customers, focused on providing them with solutions that comprehensively address their challenges, and unlock triggers to their growth. The new corporate logo brings to life the brand's refreshed promise of creating new opportunities and value for its clients, and underscores the strength and focus of its products and services portfolio. Distinctive colours represent a fresh approach, bringing vibrancy and dynamism to the brand, and stand for a new way of creating results, while the distinctive typeface lends a modern, clean look and highlights the values of innovation, insight and integrity - the core of the Company's DNA. 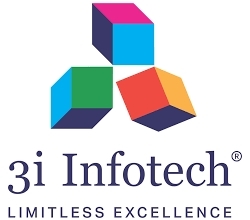 3i Infotech's new tagline "Limitless Excellence" represents its passion and zeal to go beyond the expected and deliver extraordinary levels of performance using the combination of evolved products and services, exceptional customer engagement and deeper industry expertise. 3i Infotech has also repositioned its services portfolio with the name Altiray(TM). As an end to end IT service provider, delivering to perfection is at the core of the 3i Infotech team. The new name reflects this very strength and commitment to nimbly driving consistent, best-in-class outcomes for its services clients. Headquartered in Mumbai, India since inception in 1993, 3i Infotech has over 4800 employees in 18 offices in 11 countries, and 1000+ customers in 50 countries across 4 continents. With a comprehensive set of IP based software solutions and a wide range of IT services, 3i Infotech has successfully transformed business operations of customers globally. For moreinformation, please visit www.3i-infotech.com. Corporate Communications, 3i Infotech Limited.